John Deere's Distance Trip feature allows producers to utilise GPS position to engage the tractor’s hydraulics based on distance travelled. Using the Starfire™ RTK and Greenstar™ Display system, operators can create irrigation bays without continual operation of the SCV lever. This makes the tripping of rotobucks repeatable and simple. Leave the frustrations of a laser system’s setup and maximum operating range behind. iGrade™ leveling system is a global positioning system (GPS) based water management system that can be used up to 2 km (1.2 miles) from an RTK base station. iGrade’s performance is not affected by factors that traditionally impact lasers such as dust, wind, and operating at night. This allows more work to be done without the hassle of moving base stations or waiting for outside conditions to improve. iGrade is not intended for precise, finish-grading applications. While users may experience sub-inch grading performance, environmental variations could cause vertical accuracy to vary up to +/- 5 cm (2 in.) from pass to pass. Click here to learn more about StarFire receiver vertical accuracy. An iGrade™ activation (requires Application Controller) reduces operator fatigue by automatically controlling the height of the scraper blade in water management applications. Manual adjustments are no longer needed. iGrade teams up with the Application Controller to constantly keep the scraper on grade, allowing the operator to spend more time focusing on the machinery and task. iGrade requires the receiver to have an RTK signal level. iGrade does not support WAAS, EGNOS, SF1, SF2, or SF3 signal levels. The John Deere Application Controller is required for iGrade activation. Cut-fill maps allow producers to create desired contours by moving the least amount of earth. Cut-fill maps provide best-fit or multi-fit plane designs. Beyond land leveling, this solution can be used for infrastructure design of surface drainage, contours, and terraces. 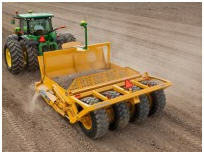 iGrade™ leveling system offers cut-fill maps when teamed up with additional software and hardware. Learn more about iGrade and cut-fill maps from a local John Deere dealer. The iGrade StarFire GNSS antenna (iGrade antenna) facilitates enhanced performance of the implement’s StarFire 3000 Receiver when utilized for iGrade that requires maximum vertical precision. Vertical accuracy can be impacted by signal interference that the StarFire 3000 Receiver is susceptible to, such as multipath. The iGrade antenna resists signal interference, allowing for the rejection of error that can typically be caused by multipath effects. It is compatible with global positioning system (GPS) offering L1, L2, and L5 satellite signals and Russian satellite constellation (GLONASS) offering G1 and G2 satellite signals, as well as the StarFire network (L-band), making it an excellent enhancement to the StarFire 3000 Receiver. The iGrade antenna is only compatible with StarFire 3000 receivers and is only intended for use on the implement receiver utilizing iGrade or other earthmoving applications. The StarFire 3000 Receiver must remain mounted to the same implement as the iGrade antenna being utilized. Use of the iGrade StarFire GNSS antenna in any other manner is neither permitted nor supported and can degrade desired performance of the paired receiver. NOTE: The StarFire 6000 Receiver is not currently compatible with external antennas. The vertical accuracy performance of the StarFire 6000 with internal antenna for iGrade applications is similar to that of the StarFire 3000 with external iGrade antenna. The iGrade antenna is recommended for commercial and high-use operators of iGrade using StarFire 3000 Receivers. Use of the iGrade antenna generally improves performance when experiencing conditions described above, but does not guarantee sub-inch grading accuracy.